Could this hub centre system be better than forks? 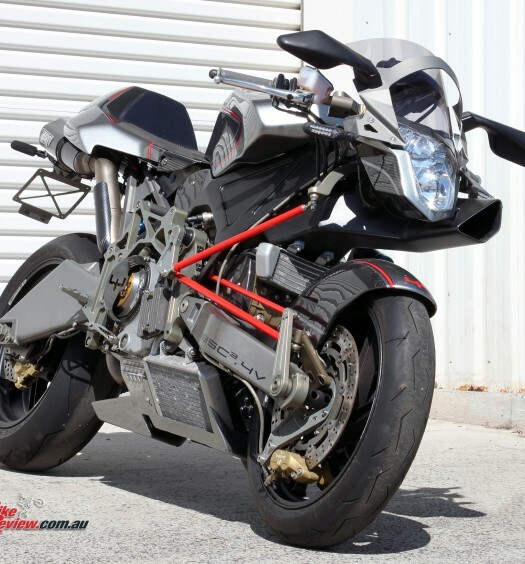 Here is our motoinno TS3 review. Test by Jeff Ware Photography by Daley Photography, Gavin Dall'Osto, Stephen Piper. 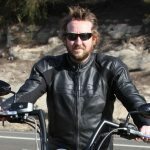 BikeReview.com.au takes me all over the world and I get to ride all sorts of bikes – like the motoinno TS3, which means I have the pleasure of meeting some amazing people. Motorcycles are about passion mixed with thrills and when those two ingredients are combined on a good day, everything lines up like a perfect apex. 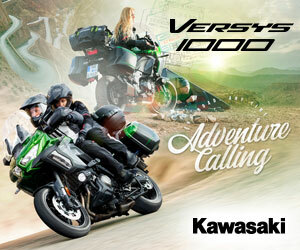 I recently had one of those days, riding an extraordinary motorcycle, right here in little old Australia. It is a bike I had a special interest in riding too, as the late Warren Willing did some work on it. Those readers familiar with my past will know I did my motorcycle mechanic apprenticeship at Willing Motorcycles, with his brother and legend racer the late Len Willing. I knew Warren and I also know the youngest Willing, Glenn. 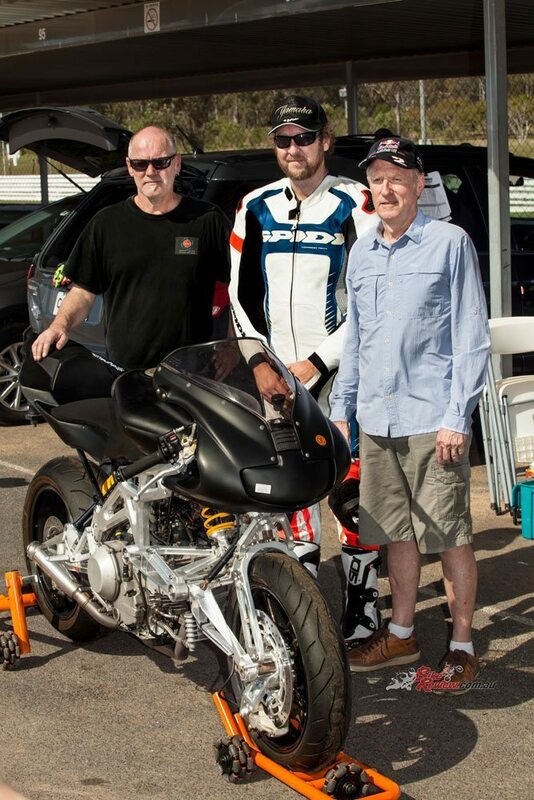 So for Warren to work on the bike, he must have been interested in it. 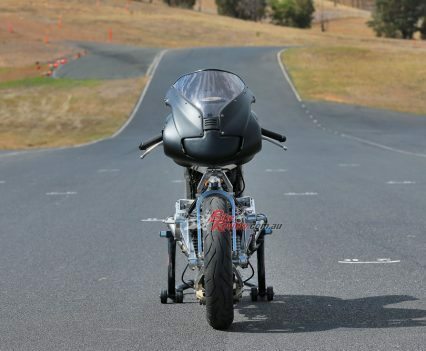 That motorcycle is the motoinno TS3, a wild looking creature that would not be out of place on a Matrix film set, which, as it happens, is not too far fetched. 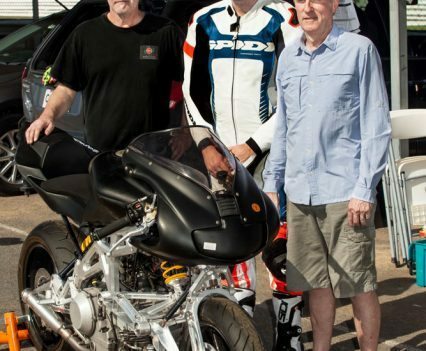 You see, the inventor of the motoinno TS3, Ray Van Steenwyk happens to have over 35-years of experience in film production and 3D Animation, with a list of movies that include Matrix Reloaded, Happy Feet 1 and 2, Mad Max 4, Hulk 2, Charlottes Web, Promethius and many more. 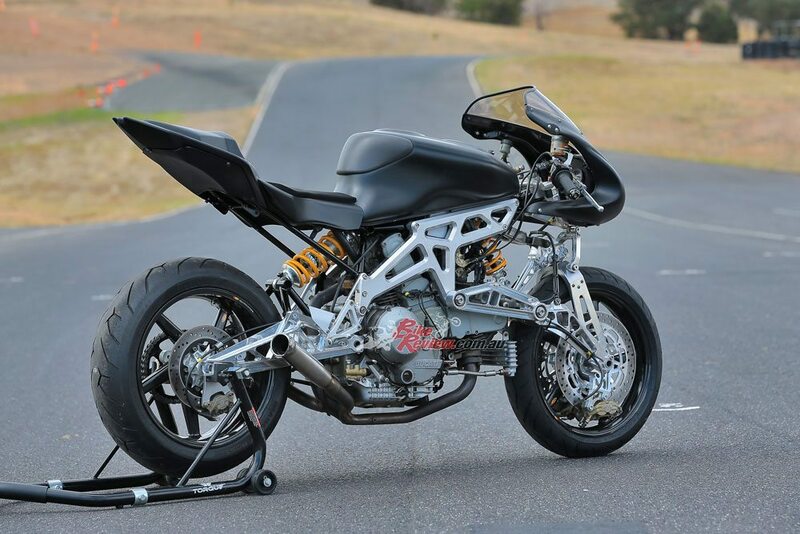 A self-taught mechanical engineer and lifetime motorcyclist, Ray eventually combined all of his skills to create this masterpiece of motorcycle and mechanical engineering. The style, the concept, the performance all reflect Ray’s background but does it work? Short answer. Yes. Here are the facts followed by the feeling. 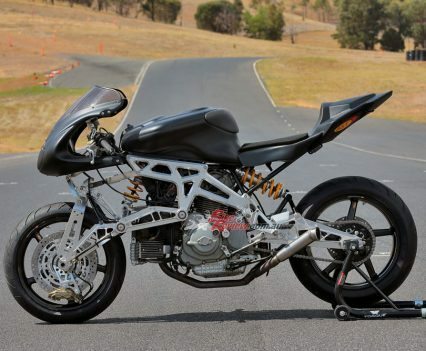 At first glance you could be forgiven for thinking that this is just another hub centre steering bike, or even a Bimota or Vyrus, but on second glance you will see huge differences and by the time you really stop and take it in you will realise the motoinno TS3 is an all-new one-off alternative hub centre steering motorcycle. 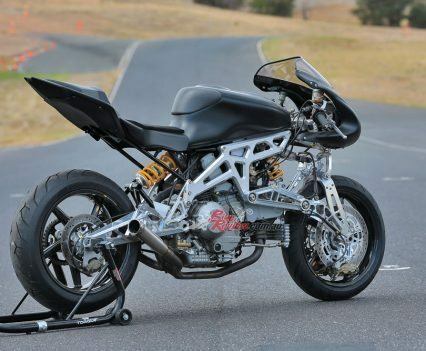 The motoinno TS3 may look familiar to you but, as you can see by comparing images to those of the GTR, Vyrus and Bimota Tesi, it really is a one-off. So, why? You have every right to ask. Bikes have had telescopic forks for over 100-years, however, manufacturers have always been aware of their flaws. Us motorcyclists have all become familiar with the front telescopic fork and generally it has been well accepted. Valentino Rossi certainly seems to be riding OK on them. However, like our esteemed Editor’s rollerblading skills, everything can be improved. Forks and their steering system present a major problem, in that steering, braking and suspension moments all affect each other. When you brake, the braking forces are put through the suspension, which leads to suspension compression. This in turn limits travel and the ability to ride bumps. 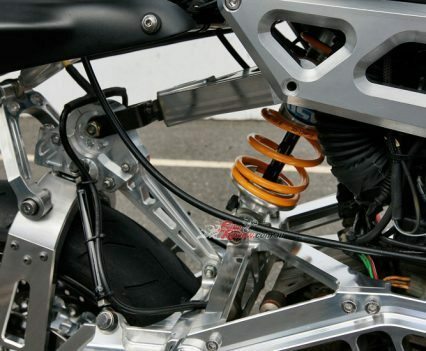 We then increase spring rates and damping forces to slow down the dive and offer support on weight shift, however, this then in turn hugely compromises suspension performance. 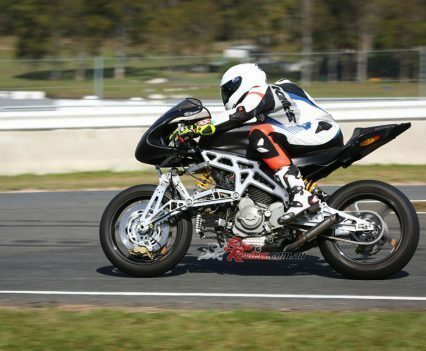 Braking hard also increases the steering angle as the forks compress and opposite happens on extension, and there are other issues such as stiction and the major one, lateral flex, which can happen mid-corner over bumps or on the brakes, causing the tyre contact patch to move away from the steering axis. This can cause wobbles or worse, tank slappers. All of this causes forces that produce torque around the steering axis, or steering head, which needs to be massive and bulky to cope. That force needs to go somewhere and that is the rider’s arms, then body, legs, the rest of the bike and more wobbles and weaves result. A steering damper helps but only deflects the forces somewhere else. There are good points with forks of course, again just ask Valentino Rossi, and we are all used to the feel of them and compensating for their flaws. The ability to adjust steering angle on the hop by using more or less braking force into a corner can be great, particularly tightening radius turns, and the feel and feedback we get through a telescopic fork front-end is both familiar but also intimate as there is very little separating our hands and the front axle. The single biggest advantage of hub centre steering is that it separates steering, braking and suspension functions into three separate moments that do not have an impact on each other. The disadvantage in the past has always been rider feel and feedback. There has always been a series of linkages separating the handlebars from the steering axis and each one takes feel away and introduces the risk of slack or play. 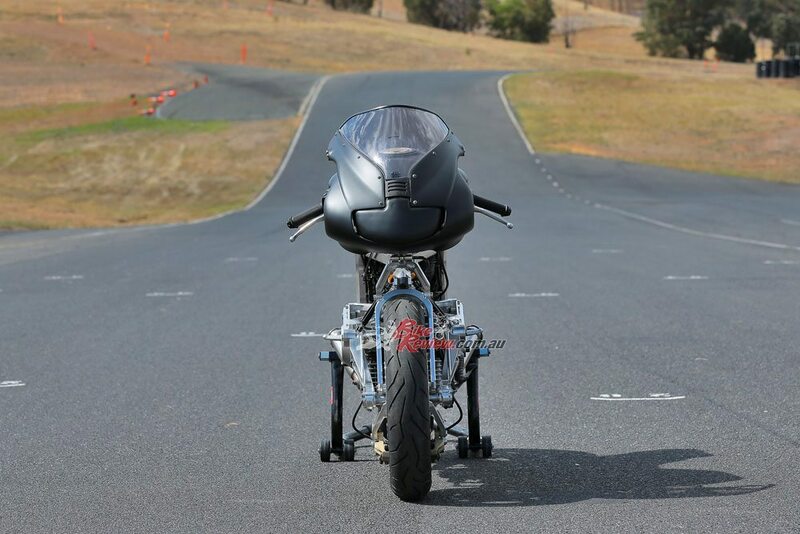 The motoinno TS3 minimises this greatly as the ‘bars are joined directly to the upper parallelogram swingarm and that in turn is mounted straight to the steering axis, so before I even rode the bike, I knew it would have better feel than other HCS designs. That is just the basics and I’m no engineer but I can tell you what the bike feels like to ride and how it behaves. 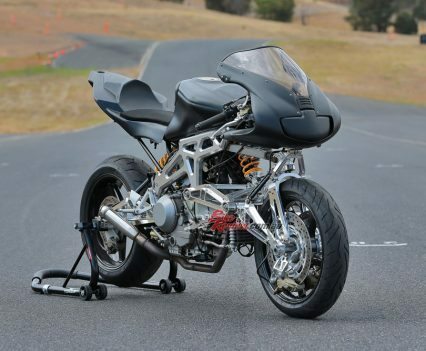 The first thing you will notice is that the donor for the motoinno prototype test bike is a Ducati 900SS. What is left of the original machine includes the engine, bodywork, dash and not much else. The engine is actually standard aside from open pipes and a remap. 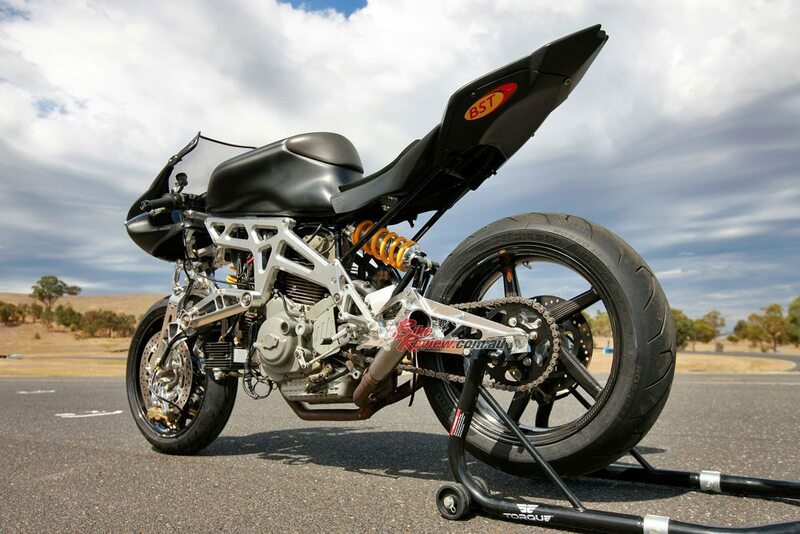 The frame is gone, replaced by a chrome-moly sub-frame at the rear, billet CNC sideplates that support it and the footpegs, the engine and the front swingarm. 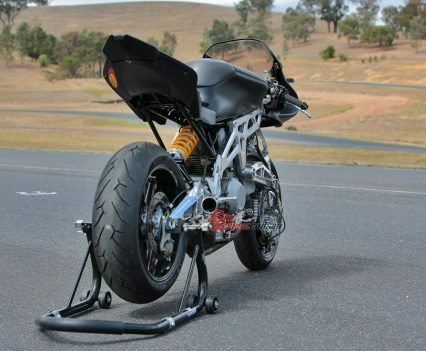 The engine thus becomes a stressed member with both the front and rear swingarms pivoting off it. There is no full steering stock, all of that is eliminated. 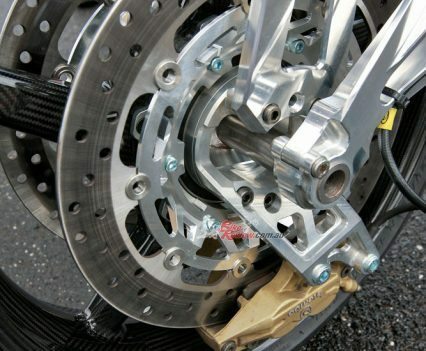 There are two offset parallelogram swingarms on the front that keep rake and trail geometry constant through suspension travel and also allow the inbuilt Pro-Dive (fully adjustable dial-in anti-dive), while braking forces are directed through the horizontal plane of the lower swingarm to the engine. 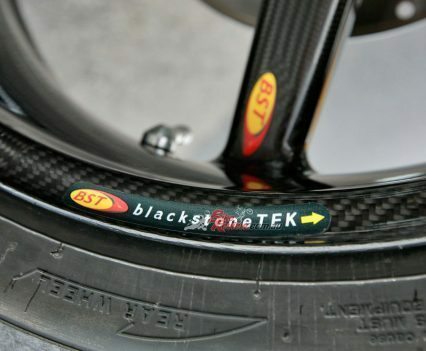 What this design does is gives the TS3 a virtual king pin that starts at the contact patch of the tyre, travels through the hub centre along the steering axis and ends above the front wheel. So, if you look at the side-on image of the front of the bike, draw a triangle from the front axle to the pivot point below the front shock, then up to the steering head lower pivot point and back down to the axle, you will see this triangulated strength – thus the TS3 (Triangulated Steering & Suspension System). What this does is almost completely eliminate a problem that some other HCS systems and all telescopic forks have, which is oscillation harmonics from the wheel or the king pin, which is under huge loads. It also eliminates ground clearance issues, which some systems in the past have had due to the size of the front swinging arms they have had to employ. The TS3 system is highly adjustable. Both ends feature a custom made fully adjustable Afco shock, easily accessible, while rake and trail can be adjusted from 15º to 24º. For this test the rake was set to 19º and trail correspondingly was 98mm. Weight bias is 52/48 and dry weight a stunning 161kg. Unlike other HCS bikes, the TS3 has a tight turning circle of 27º lock each side, totalling 54º, around 25 per cent more than an average telescopic bike. Wheelbase is a short 1394mm. Dive under braking can be adjusted via the Pro-Dive system invented by Ray. For my test, 25 per cent dive was dialled in, leaving 75 per cent of suspension travel available at all times under hard braking. 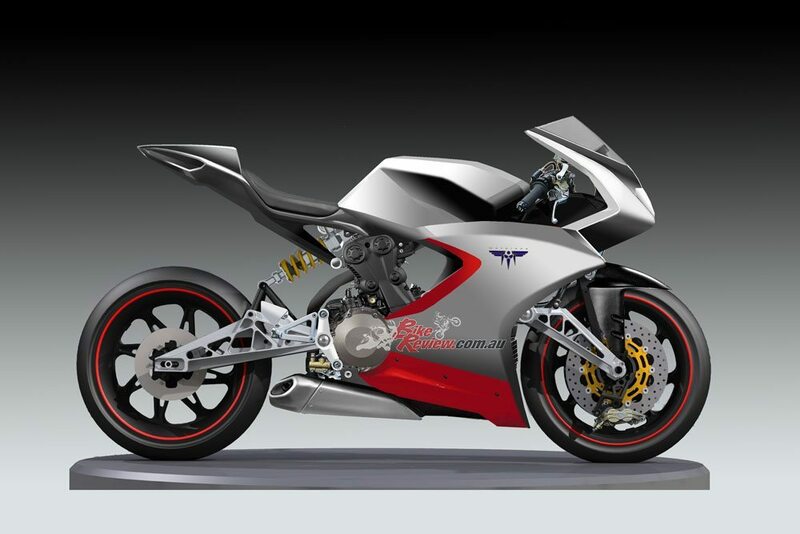 The wheels are also lightweight BST carbon-fibre and the brakes are standard Ducati 900SS Brembo stoppers. 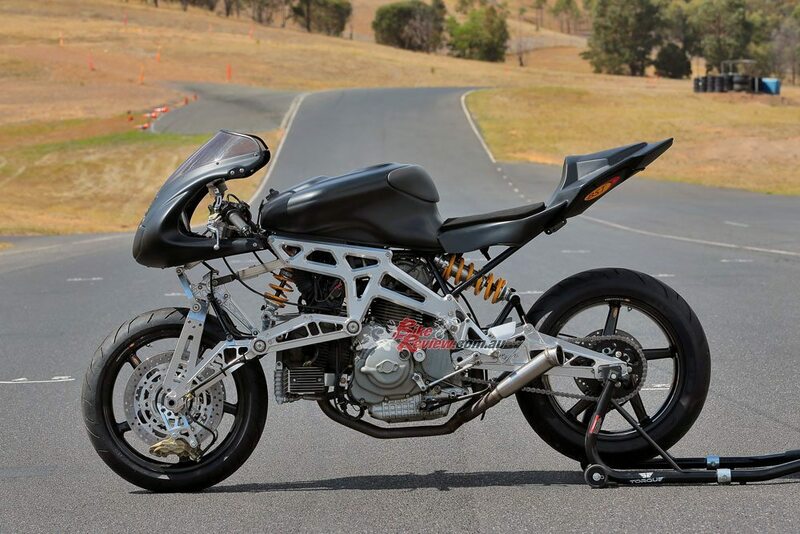 There is no doubt, it is an amazing bike that was designed and built here in Australia over a 10-year period (see breakout). Testing a prototype with accuracy takes a lot of experience – you need hundreds of tests under your belt to give real feedback on a prototype. 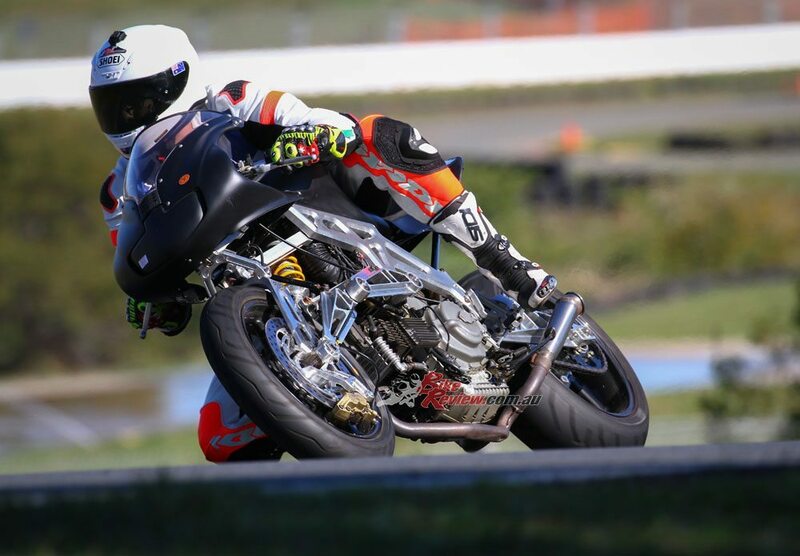 You also need racing experience and race bike development experience along with a good feel for tyres or all brands and types. Otherwise you just don’t have enough comparisons in the test bank to offer a true opinion and accurate notes. You also have to be prepared to put yourself on the line and push the bike past its limits, ideally without crashing of course, and you have to trust the builder and hope it is all strong enough. You also have the responsibility of not damaging a bike that can often be worth a million bucks and be difficult, or impossible, to repair or replace. Along with that, it is very important you give meaningful and accurate feedback, as there is a responsibility there to not lead the owner or developer on a path that is completely wrong or inaccurate. Doing all of the above at a dangerous place like Lakeside Park just adds another challenge but this is part of the job I love. I had a test plan in place before I arrived, which was to ease into Lakeside Park after a two decade gap and gently feel my way into the bones of the bike, do a thorough mechanical check over, make any subtle set-up tweaks (very few in the end, in fact only tyre pressures), then gradually build to pushing the bike to crashing point but not crashing. 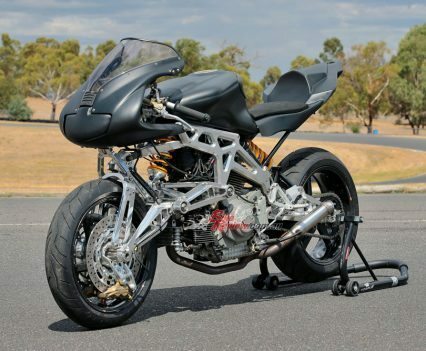 I wanted to see how far the motoinno TS3 front end could be pushed compared to conventional forks as best as possible without having an identical bike on identical tyres fitted with forks on hand to do a direct comparison. I’m not that nervous as I hop on the TS3, I’ve gone over the bike and I’m confident it is going to be safe. The engine has done a few laps in its life so I plan on being easy on the older two-valve Desmo. 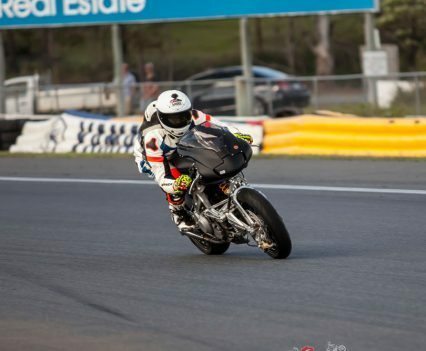 Ray fires the bike into life and I grab a gear and roll out onto Lakeside Park’s short front straight. I’m surrounded by other bikes, which makes me nervous, and there is a no passing on the first lap rule. I get a feel for the brakes, steering, engine character and gearbox while trundling along with the group and I also take in Lakeside – as it has been a long while. 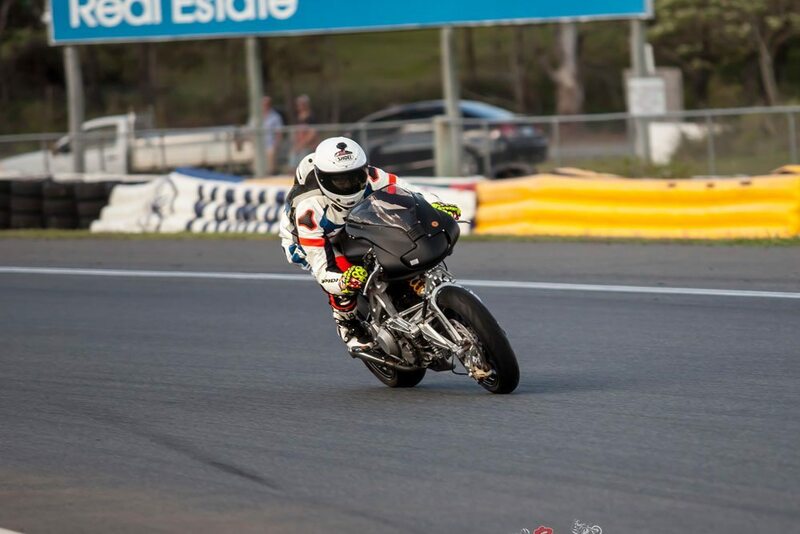 As we all round the final corner, I put my head on the tank and hit the go switch. Within two corners my knee is on the ground and I’m feeling like I have been riding this bike for an entire racing season, not two-minutes. From this point onwards, I know I am in for a good ride and I know that the motoinno TS3 is more than just pretty CNC work and wild looks. Why am I so comfortable on this bike? 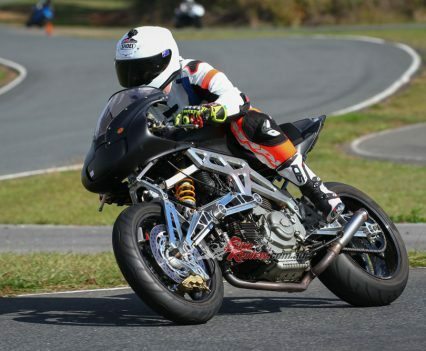 The answer is that I am a front-end rider and I always need a planted, solid and confidence-inspiring front end to be able string a good lap together, or to have a good Sunday run on the road. 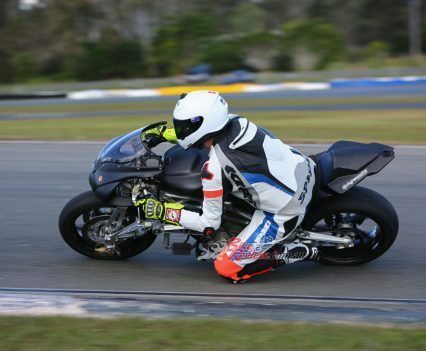 Let’s face it; a rider that has faith in the front tyre can do almost anything on a motorcycle. So I feel good on the bike, a big relief, and can now push on to dig some info up on this invention. I circulate at the same pace for two more laps to learn more about the feedback and work out where the bumps are as well. I then push a little harder, first on the brakes, just a little later at a time into the Bus Stop and T2, trying to get a feel for the tyre and what the bike does. It feels strange as there is the initial dive, which is comforting in a way and familiar, followed by a sensation that left me wondering if the suspension was actually travelling up and down through its stroke or the track was simply billiard table smooth. I assure you it is not the latter! For the last few laps of the session I take that hard late braking and introduce turn-in into it, again trying to get a feel for edge grip/sidewall compression and how far I can push before a front-end lose. 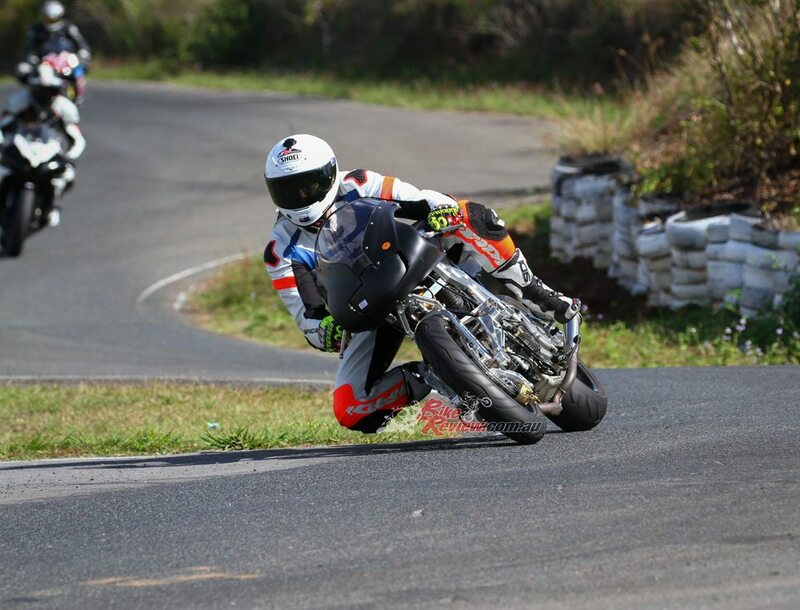 I also play with lines and discover that regardless of corner entry or turn-in point, if there is a slower rider ahead, I can simply push the bike a bit further over and steer tighter and go underneath any bike I happen to come across. Exiting the final corner I can choose where I want to be, even hugging the inside all the way around despite carrying incredible mid-corner speed. It is like there is more front tyre available in reserve there if needed at all times, a bit like insurance. This makes the bike very raceable. It would be fantastic on an opening lap negotiating the pack, darting up the inside, around the outside, anywhere! It would also be a great wet weather bike, carrying less lean angle for a given corner speed, allowing more safety margin and, ultimately, grip. The session ends with some front tyre chatter in the long tightening radius double-apex T2 combo and no sign yet of any other limitations. After having a lot of experience on the 900SS platform, including racing one, I enter the pits very impressed with the TS3. In fact, I admit I was a little shocked at how well the initial test session went. I head out for my second session an hour later with a clear set of processes I want to go through to push this bike more. 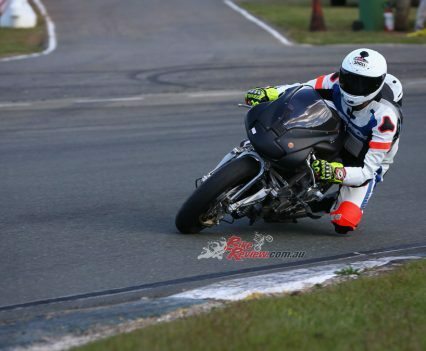 I begin by simply getting into a rhythm on the bike, which only takes a lap to be honest; such is my confidence in the front-end. I’m still not getting the familiar communication I get from telescopic forks and a steering-head, but I do have trust in the front as I have already overcome that purposely over the top corner entry, ‘Well, deep breath here we go if I’m going to crash this will be it,’ moment and came out the other side, so kept it at that level from that point. The feel is coming to me but the tyre pressure is too high and causing some feel and chatter problem. 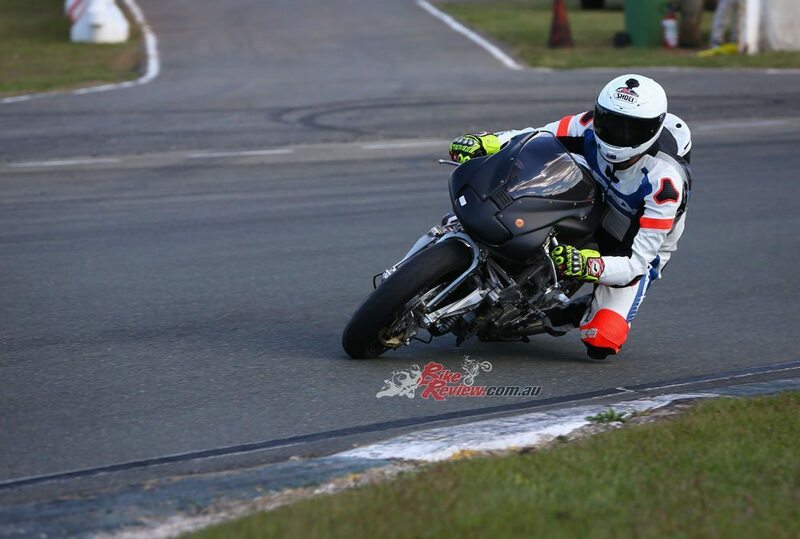 Regardless, I begin to test lean angle and how far that front tyre can be pushed before it has a little ‘tuck’. This is a touchy job and I really don’t want to crash the TS3 but I really want to know the answer! 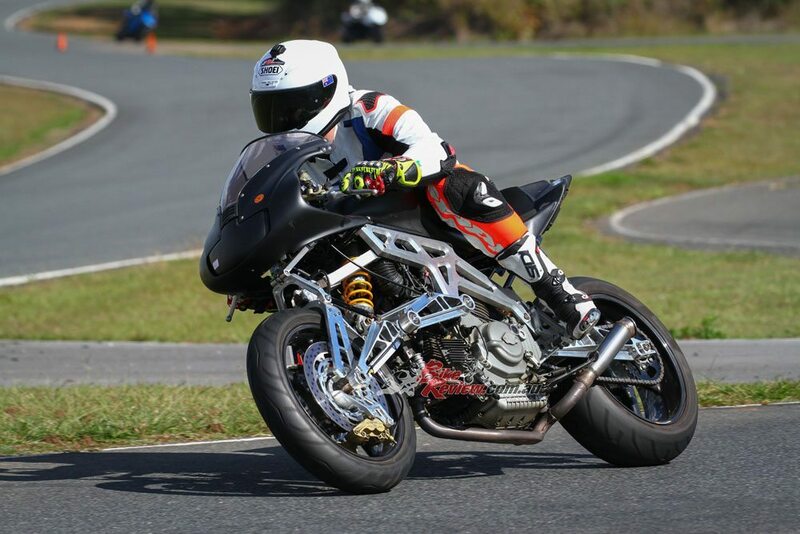 I push and lean and push and lean and there seems to be no end to this limit, then it suddenly tells me to back off – a front fold into the second half of the apex of turns TT2. It was communicable, there was warning and I simply did a Marquez and dug my knee in, only with nowhere near the style and grace that he does it with! The fact that to get to that point of the rear tyre took so much pushing really is testament to the front, I feel, and as I roll back into the pits I’m yet again impressed. I would not have got that rear slide with a conventional front end, as the front would have folded before the rear could even get into that situation. Interesting stuff. After some discussion between session one and two, we agree to drop the front tyre pressure by 3psi and the rear by 4psi. This didn’t happen for the second session but does for the third. This fixes the chatter and transforms the bike. No other changes were required. After a cold drink I head out for a last session on the TS3. The temperature has dropped and there is a cooler breeze and the Ducati 900SS engine feels crisper and cleaner and has a few more horsepower. I’m wringing every last horsepower out of this poor motor revving it beyond where it should be but it is holding up admirably well, as is the gearbox and clutch. 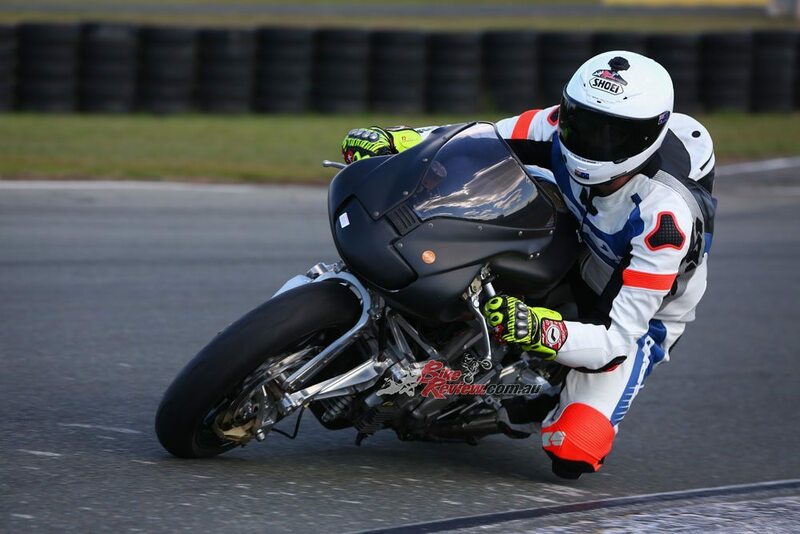 I have already tested the braking capabilities, the braking and turn-in transition, lean angle behaviour, line changing into, through and out of turns and the high speed stability, so now it is time to pose for a few photos for a few laps and then ride the motoinno TS3 like I stole it. 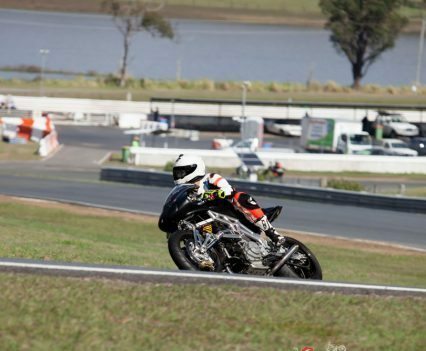 I put my head on the tank, literally, and hold it flat in fifth gear onto the main chute, holding a tight line with ease and therefore mid track and using less tyre, on a corner where often you are just about kissing the Armco on the outside. I then snick sixth just before the turn one kink completely flat out, full throttle and touching my boot, and the redline just before preparing for the ultra-late braking point for turn two. Normally you want to slow but not wash off too much speed into here but on the TS3 I am able to go really deep, brake hard and still easily get it turned and on line, without losing speed. A quick burst of throttle has the TS3 rolling fast for the second apex and again I easily get the bike turned, tight and not at all near the bumpy outside part of the track, leaving me on the paint on the inside of the apex and ready to accelerate hard towards the famous Bus Stop, the motoinno TS3 simply leaps forward like a wild animal with only a very gentle wiggle of the ‘bars. The Bus Stop entry is where the advantage of the TS3 really shines. I brake as late as I would ever dare. In fact I squeeze the Brembo lever as hard as I can and still, easily flick the bike left and right into the Bus Stop, on as tight a line as I could on a 125 GP bike. On exit of the Bus Stop I have to wrestle the bike through, however, this is the only part of the lap where the steering geometry settings feel conservative and I am carrying more speed than I would attempt on a conventional bike, making a mess of the exit on this occasion. Accelerating hard down the hill where the bridge used to be, I recall seeing bikes drifting out to the edge of the track here. 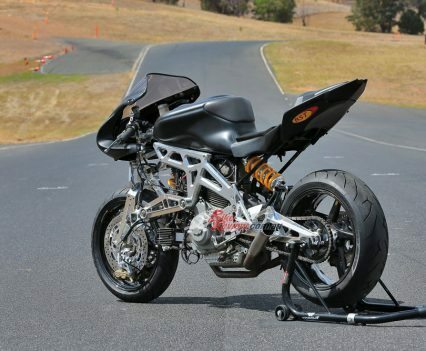 Not the motoinno TS3. I’m a good few meters off the outside and in fact pass some bikes up the inside, before swinging into the fast uphill Hungry Corner, a classic spot for front-end loses. Not on the TS3 however. It remains solid and planted throughout with no ground clearance issues. Full throttle up the hill from the apex of Hungry Corner and I run the TS3 up the slope of Eastern Loop while braking and turning in. This corner has a habit of sucking you in late and you either run wide or lose the front. 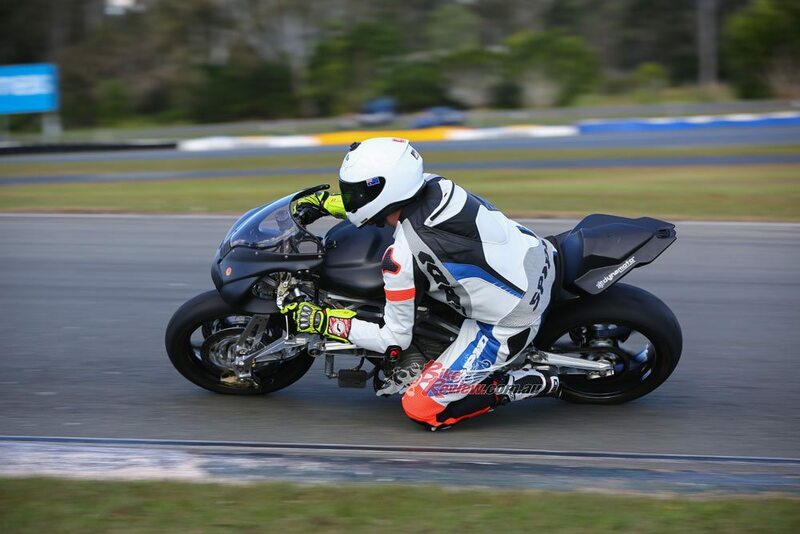 On the motoinno TS3 I am able to get in a little hot and uncomfortable but still pull it in to the apex here safely. It was here I was getting some decent rear end drifting off the turn though for the fast run down the hill for the entry to turn seven, where the lap starts all over again. The dropped tyre pressures mean I have a more intimate feel for the front and I am getting more acquainted with that each lap, however, it’d take me a bit longer than one day to fully understand the feedback so right now it is a mixture of trust and experience. 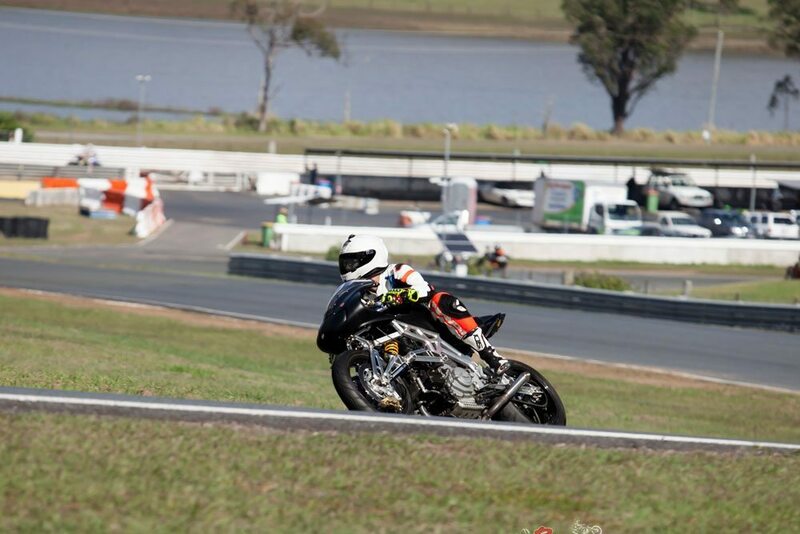 Another fun few laps and I decide it’s time to give the two-valve a rest and I head in before the flag. A look at the tyres reveals I was off the edge of the rear yet had a good few mm left in reserve on the front, which is not unusual but the next challenge for Ray and team will be getting that rear end to go that little bit further to help get more advantage from the front (this is purely from a racer perspective and not required for road or track day applications though). Overall, I was very impressed with the TS3 and the positives for me outweigh the negatives so far. That feel would improve further with full competition race rubber fitted on the track and I can’t comment on what the feel would be like on the public roads until I try it. What were the negatives? Not many. I would like a feeling of more resistance to steering inputs as I am used to pushing on a bar with a certain amount of pressure and resistance to get a bike turning, whereas the TS3 feels like the front tyre is suspended it is that light, so I did oversteer occasionally when riding on autopilot at the limit. I could feel what I thought was a small amount of flex or movement between the bars and the wheel actually turning, only during quick changes of direction. The positives are clear though, with improved braking capabilities, steering behaviour and suspension freedom (it can work unhindered) making this a great ride. Now the question everyone wants to know. Is the TS3 better than a bike with telescopic forks? 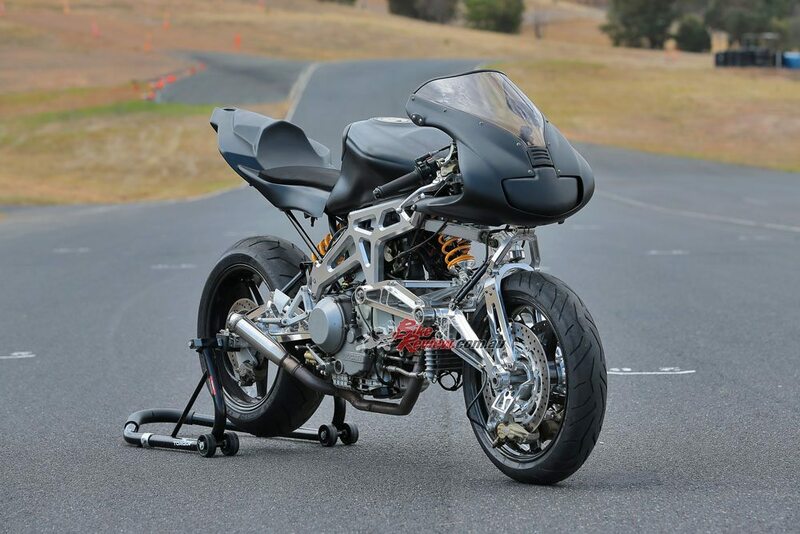 I can’t answer that it’s too open a question, however, on my day, on that track, on that bike, I can confidently say that I would not have been able to take a Ducati 900SS with a conventional front-end to the same limits as I could take the motoinno TS3 to. Inventor of the system, Ray Van Steenwyk has over 34 years of advertising, feature film and television work to his credit and is skilled in Art Direction, 3D Animation, Design and Production. He is a self-taught mechanical engineer and is proficient in CAD and motorcycle dynamics as well as studying all the relevant data on alternate steering and suspension systems that are in print today, all learnt over the many years of bringing the TS3 bike into fruition. Long-time friend, business partner and company director, Colin Oddy, is also a veteran of the TV and Film world with a 20 year career as a Producer/Production Manager on scores of TV commercials, corporate and network documentaries and screen credits on feature films and US television productions. He is proficient in sourcing and bringing together valuable production and financial aspects of commercial development. 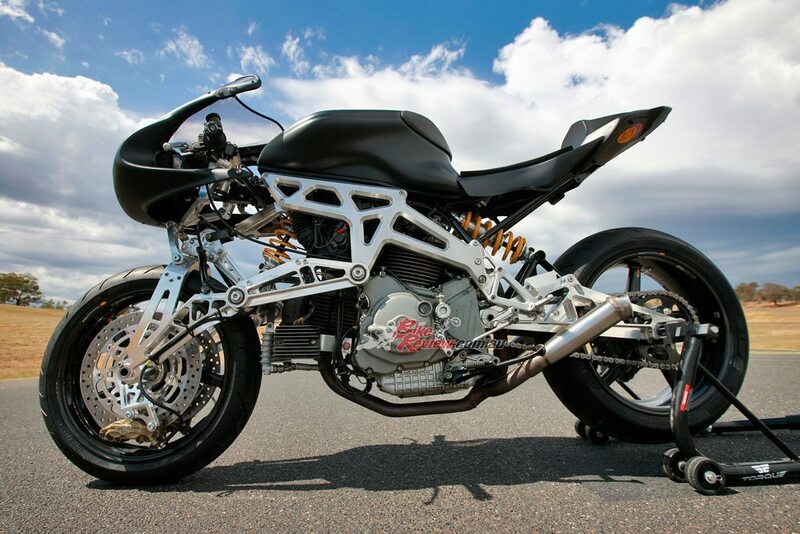 The TS3 bike was developed over a 10-year design stage to get the front-end geometry working. In July of 2008 CAD designs and FEA simulations on components were started and approved. 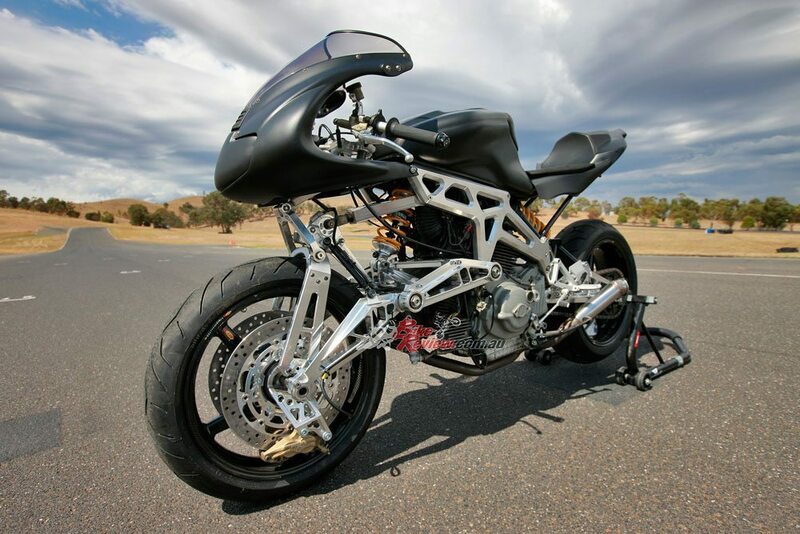 CNC parts were then produced through 2009 – 2010 culminating in the current components being crafted by Brisbane based CNC fabricator, Gordon Gilmour to complete the bike in 2011.
builds all forms of complex machinery for the Film and TV industry. Further design improvements were implemented during 2014 – 2015. 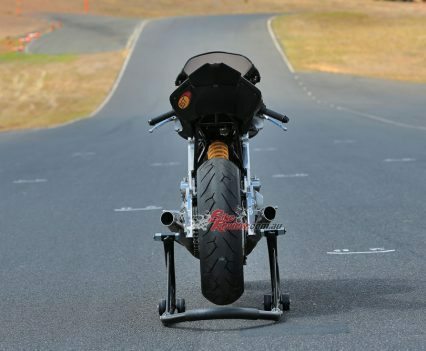 Initial track testing of the bike’s new system was started in November 2011 and suspension set-up was conducted by MotoGP race expert and guru the late Warren Willing in 2012 to produce a consistent, compliant and stable front and rear end platform. 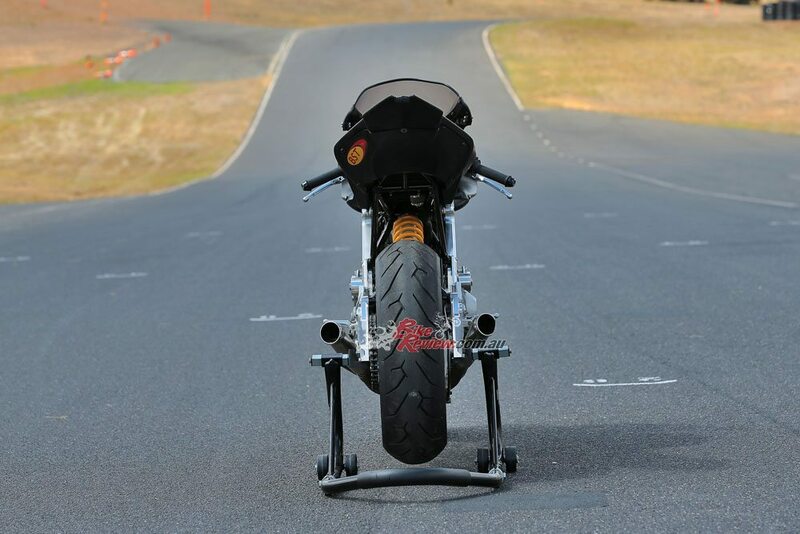 On track testing has provided MCI with empirical data that consistently shows the new front-end gives the prototype the ability to enter a corner smoother and faster with a very much reduced flip flop counter steer action to begin the turn. 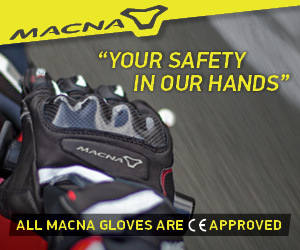 It has been proven to maintain a greater corner speed with a higher rate of turn for less lean and can be picked up out of a corner faster without running wide either on or off the throttle – all with less input from the bike and less fatigue on the rider. The front end also appears to be immune from front wheel and king pin oscillation harmonics that can upset normal suspension, including under heavy braking. Ducati 900SS, 904cc 90º V-twin Desmodromic two-valve per cylinder air/oil-cooled four-stroke. 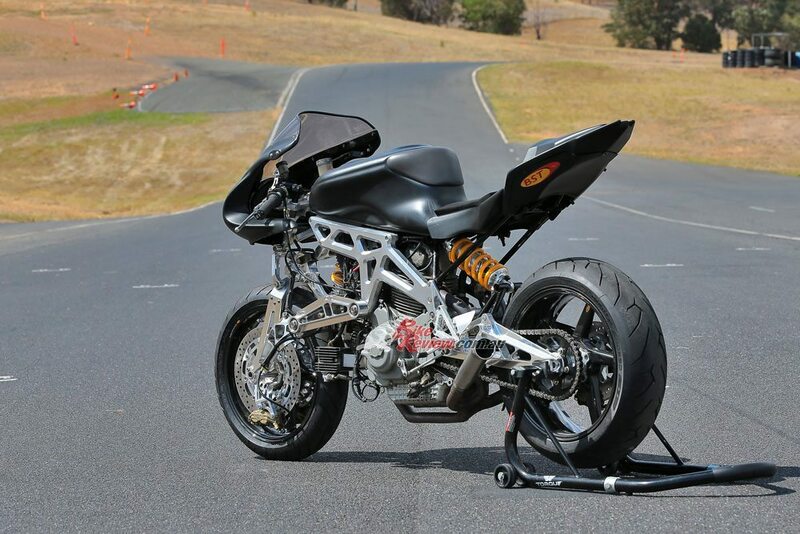 92 x 68mm bore x stroke, 9.2:1 compression, six-speed gearbox with dry clutch, custom air intake and exhaust, re-tuned EFI. 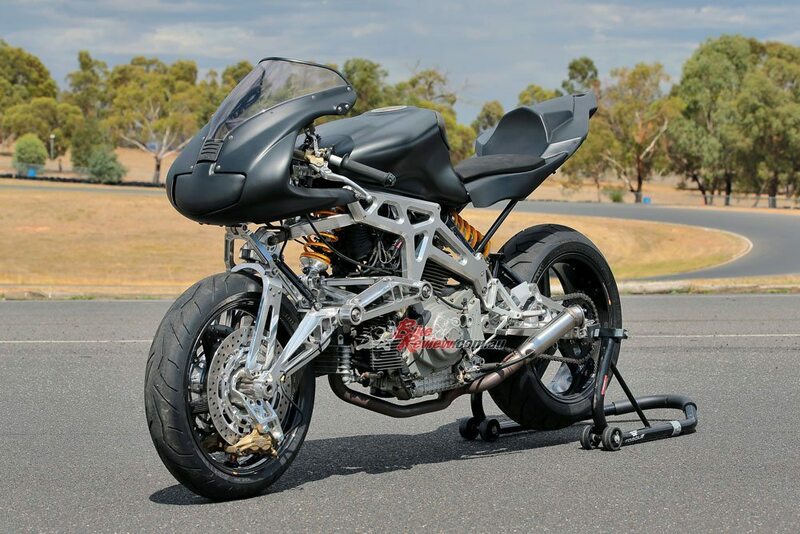 Frame and swingarm material, billet CNC machined 6064 aluminium, sub-frame chrome-moly, rake 15 to 24 degrees variable, trail 98mm to 19 degrees variable, Pro-Dive/Anti-Dive variable from zero to 100 per cent, steering – scissor (shear) link hub-centre steer. Front and rear shocks, Afco T2 custom fully adjustable. 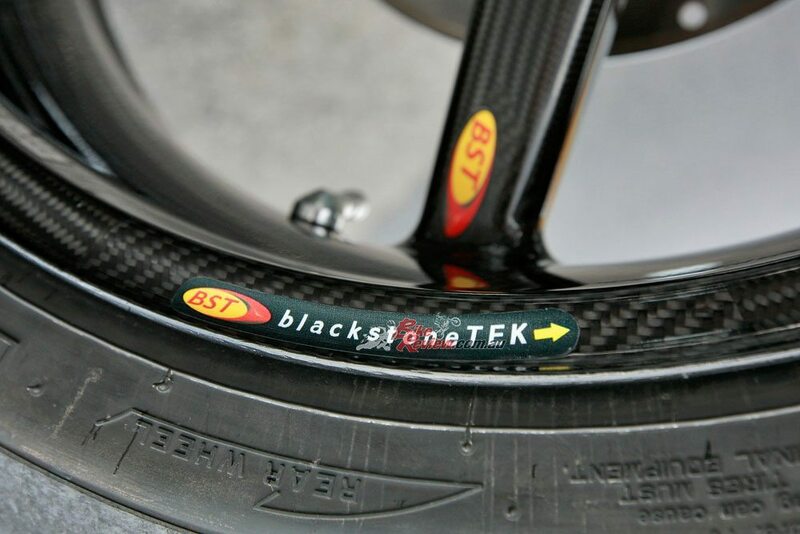 BST carbon-fibre wheels and Pirelli tyres 120/70-17 (f), 180/60-17 (r). 320mm dual Brembo rotors and four-piston Brembo calipers (f), single 200mm Brembo rotor and two-piston Brembo caliper (r), Brembo master-cylinders. 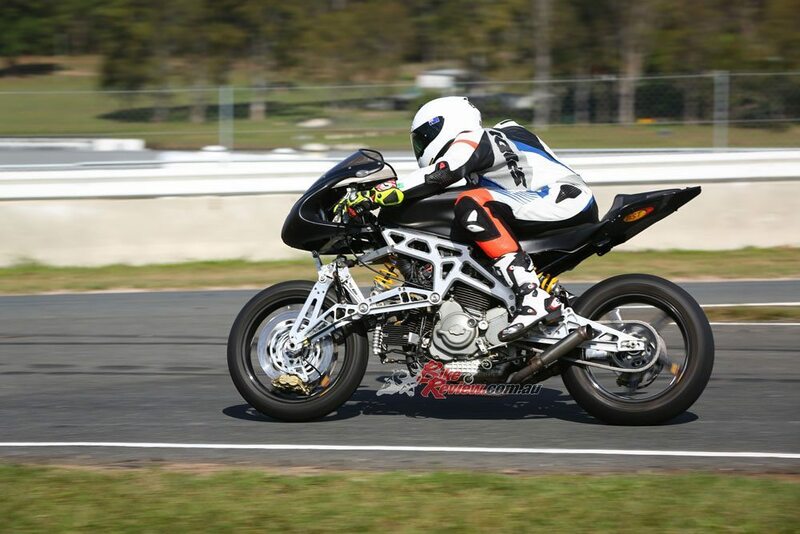 Australian designed and built, brilliant to ride!